The Spheres by Bert Flugelman; two large stainless steel spheres with a diameter of 2.15 metres balanced one on top of the other. 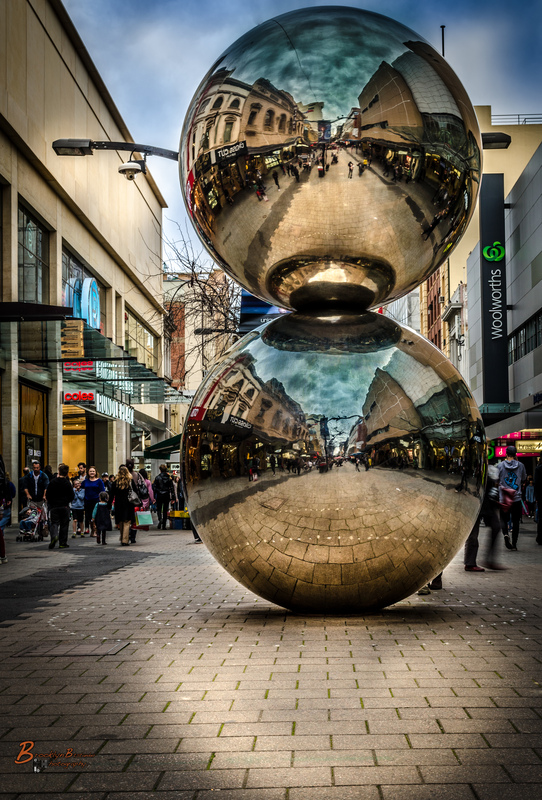 They are most commonly referred to as the Mall’s Balls orRundle Mall balls. “The Mall’s Balls” are a common meeting place for visitors. Erected in 1977, they were commissioned by the then Hindmarsh Building Society (subsequently absorbed into the Adelaide Bank) and donated to the City of Adelaide to mark the building society’s 1977 centenary. This entry was posted in Photography and tagged Adelaide, colour, digital, Lightroom, Photography, poetry, sky, stainless steel spheres. Bookmark the permalink. Nice shot Mike. Yes, the Balls and the Pigs also, are good meeting places. Back in the dark ages, it was Beehive Corner 🙂 Way before it became a Mall…. Long time since I’ve been there now tho…. No I did not know about the Horse, how spectacular ! Trying to find your reflection Mike !!! I made sure I took the Photo so I would not be in the reflection. Did not want to spoil the Shot…LOL !!!! I KNEW IT : )) It was a great shot! Great shot, great perspective and great verse. The trifecta. Very cool shot! The reflections are great. Great composition Mike and awesome reflection!! Love the reflection through the bals. splendid photo and beautiful word accompaniment! I think it helped that I had a nice cloudy day for good effect. Yes they are Big !!! Haven’t seen a picture of these better than this one Mike, it really is brilliant! I’ve been there! Brings back the memories, but your photo is much better than mine!